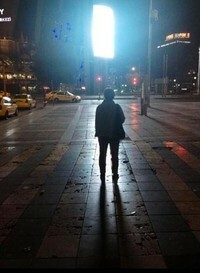 Last night, a man stood still in Taksim Square and did not move at all for hours. Became viral on social media as “duranadam” (standing-still man), the man inspired many others to join him. Around 2 am local time, police detained those who were standing still with “duranadam”. Last night, around 8:25 pm local time, a man stood still in Taksim Square facing AKM building and did not move at all for hours. Became viral on social media as “duranadam” (standing-still man), the man inspired many others to join him. Some eyewitnesses claim that he has been standing still at the same location since yesterday afternoon. 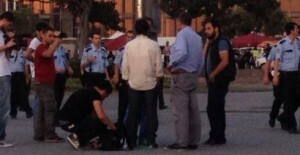 Police checked standing-still man’s belongings – a backpack sitting next to his feet. The peaceful protest became viral on social media with “duranadam” hashtag being a top trend. Other “standing-still people” showed up in Taksim Square. Around 1:15 am local time, a crowd formed a circle around the standing-still man to support his cause. Hundreds of people stood still in Taksim Sqaure like trees. Many users warned other protestors to leave the standing-still man alone to avoid police interventions. However, protestors did not do so – around 2 am local time police detained allegedly detained all protestors including the standing-still man. Then, the reports were corrected as police did not detain the standing-still man. It went without saying that the standing-still man was Erdem Gündüz, a performance artist. As the standing-still protests became viral across Turkey, a woman protestor stood still at where Ethem Sarısülük – a Gezi Park protestor who was allegedly shot dead by police in Ankara – fell to the ground in downtown Ankara. She was then known as “durankadın” (standing-still woman). This entry was posted in News and tagged Ankara, duranadam, Erdem Gunduz, Ethem Sarısülük, Standing Man, Taksim on 18 June 2013 .